Australian Ambassador to Seoul Peter Rowe makes a speech in front of a large audience gathered at the "2008 Business Awards" ceremony held at Seoul's Grand Hyatt Hotel on Nov. 3, 2008. 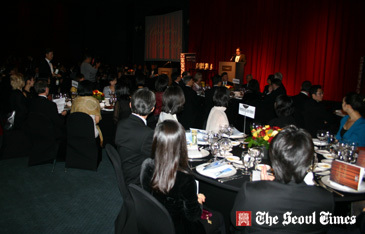 Australian Ambassador to Seoul Peter Rowe was recently invited to the "2008 Business Awards" ceremony. The event took place on Nov. 3, and was hosted by the Australian New Zealand Chamber of Commerce in Korea (ANZCCK), at Seoul's Grand Hyatt Hotel. Amb. 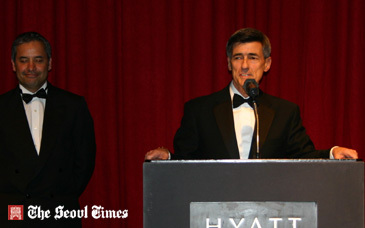 Rowe made a speech before some 500 guests gathered in the hotel's Regency Room. Awards for excellent performance in seven business categories were given to local, Australia, and New Zealand businesses. Several hundred guests were invited to the "2008 Business Awards" ceremony held at the Grand Hyatt Hotel in Seoul on Nov. 3, 2008. The winners of this year's Business Awards are: Best SME: KOKOS, Investment of the Year: ZESPRI, Environmental Excellence & Corporate Social Responsibility: McDONALD'S KOREA, Best Services Company: MACQUARIE SECURITIES, Trade Excellence: SUNCHANG CORPORATION, Chairman's Award: E-MART, and Business of the Year: MACQUARIE. This is the third consecutive year ANZCCK has hosted this prestigious awards event. Awards are given to local Korean businesses, or companies in Australia or New Zealand. Recipients are selected by the ANZCCK committee, according to their overall business performance and contribution to international ties between S. Korea and the two countries. For more details or inquiries call contact Executive Director Pilar Perez of ANZCCK in Seoul at 02-889-8371.